Saved $101.38 on makeup!!!!!!!!!!! Paid $15.79!!!!!!!!!! Yep it’s Saturday. Time for shopping! 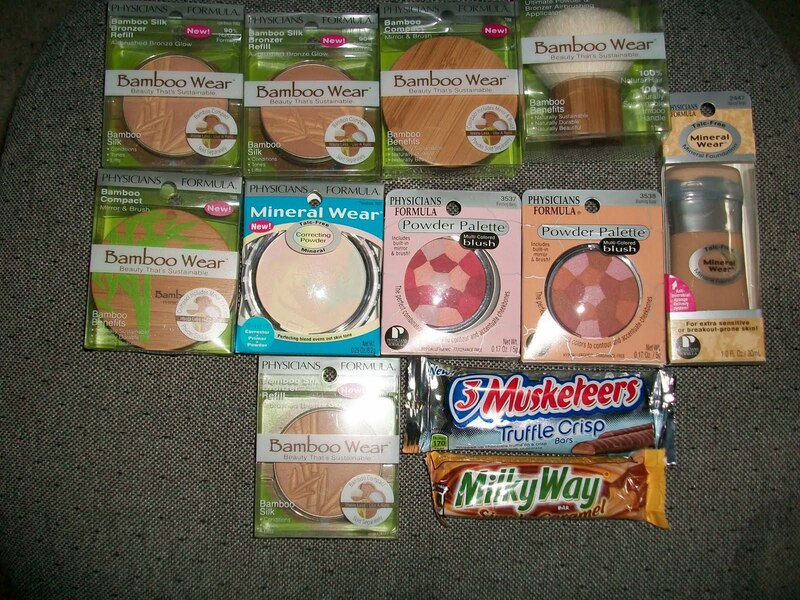 I went to CVS today and got (10) Physicians Formula items for $15.79 (minus $1 for the candy which I actually got free because I got an extra care buck back for it), if you wear this kind of makeup you know that most items are over $15 for one item! So basically I will make money on this deal and I got about $117.00 worth of makeup for nearly nothing! Here’s a few tips for finding deals like this. 1) Reinchecks, this extends the sale for up to 30 days that way you can wait for a coupon to match it up with. If it’s an item you always use go to ebay.com or another coupon clipping site. Buy the coupons and match up with the sale for maximum savings! Always do the math and make sure it will be worth it to buy the coupons. Usually it is! A lot of them come in stacks of (20). So if you are buying something like granola bars and the coupons are $1 of each box…and say they are only $1.75 each anyway. Then this would be the time to pounce! lol If (20) coupons are only a few bucks then this is well worth it. Those are the kinds of deals I watch for. 2) Follow money saving websites. Here are some of my favs that I use a lot. 3) Target.com (for lots of printable coupons) not just for Target store coupons you can print manufacturer ones too. Also, you can use 2 coupons for one item at Target (one manufacturer and one store coupon). Here’s an example. Last week I had $3 off manufacturer coupons for the Nivea Happy sensation lotion, Target also had $1 off printable for the same lotion so I was able to get a bottle for $1.04 for a huge bottle. 4) Get the Sunday paper ( I usually get at least five copies) if theres a good coupon for an item I use a lot I want to stock up! 5) Be one step ahead of the sales and coupons. I like to check out http://www.sundaycouponpreview.com/ and then coupondivas.com she usually posts the sales a day early. Also, if I find a great deal you can count on me posting a link to it on this blog. Like my blog on facebook for daily updates! Also, if you have any questions. I would be happy to answer them. Just post a message on my wall on Facebook or leave a comment below. 🙂 I would be happy to help you! Previous post*HOT* $20 Voucher for Esse Reusable Bags for FREE!!! Next postTarget Haul! $18 Cal King Sheet sets!